Presented below is a list of frequently asked questions. If you can't find the answer you're looking for please contact us and we'll do our best to help. + Do the ski schools speak English? All of Méribel’s ski schools offer English speaking instructors for both group and private lessons. Just make sure you specify an English speaker when you book. + I Have recently bought my first snowboard, should I be doing anything to the board (i.e. waxing or the like) before taking it out on the slopes? Definetly get it waxed when you get there, depending on the snow temperature depends on which wax, but it will make a big difference. Also with it being a new board you'll need it de-tuning (local shop will help you out), basically de-tuning the edges at the front and back will help avoid catching your edge. + At what age should my child start skiing? Most ski teachers wouldn’t recommend starting skiing before the age of three or four at the earliest. The right age will vary from child to child, and depends upon the child’s strength, co-ordination and attitude. For this age group skiing should remain a play activity, so don't expect a young child to ski all day - a couple of hours is ample. Remember children lose heat faster than adults so dress according to the weather conditions and make provision for it changing - hats, waterproofs and gloves are essentials. Helmets are recommended too. Remember to protect your child's eyes and skin from the sun - not only are the infra-red and UV rays less filtered by the atmosphere at altitude, but 85% of the rays are reflected by the snow. Use category 3 or 4 UV sunglasses/goggles, and reapply SPF30 suncream at least every two hours. It's a good idea to have a contact phone number and address in your child's pocket in case you become separated on the mountain. + Can I get out of the way of an avalanche? Dry slab avalanches typically reach a speed of 90-130 km/h within about 5 seconds after they fracture. Avalanches that descend from above kill very few people. Wet avalanches usually travel much more slowly, around 30 km/h. + How can I begin to evaluate if the snow is stable or if it can fail? Look and Listen: you can understand a lot just by watching and listening. Look: Recent avalanche activity is the most practical way to begin to evaluate the snowpack stability: if all of the east-facing slopes around you have evidence of recent avalanche activity and you are about to set out onto the only east facing slope that has not avalanched, this is clearly not a good idea. Listen: When you hear and feel 'whoomphing', the snowpack is collapsing beneath you. The snowpack is telling you that it is unstable. If you are on a steep slope, it will be more than telling you, it will be releasing at the same time as the 'woomph'. First thing in the morning after a snowstorm, snowpack stability is often uncertain. So, it's a good idea to start out on low-angle slopes - while constantly looking around to see if there are any consistent 'themes' in the recent avalanche activity (slope aspects, depth of slabs, steepness of slopes etc.) For example, if you notice that many northwest facing slopes have avalanched, this is a theme and a clue that there is significant instability on those slopes. 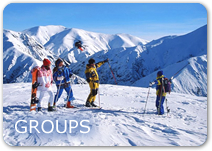 Whether or not it is advisable to venture out onto those slopes depends on many other factors ranging from group dynamics and skill level to recent weather events, (e.g. rapid temperature fluctuations), steepness of slopes and the terrain below. Never base evaluation of stability on only one clue!!! + How do I judge if a slope is 'dangerous'? Steepness: Almost all avalanches occur on slopes between 35 and 45 degrees. An 'expert' slope at a ski resort is usually around 35 degrees maximum. Anchors: Trees and rocks that stick up through the snowpack can help to hold the snowpack in place. But the anchors need to be fairly thick to be effective. For instance a thick, mature grove of evergreen trees anchor the slab quite effectively while a sparse grove of trees has very little effect. Aspect with respect to wind: Recently wind-loaded, steep slopes are almost always very dangerous while recently wind-eroded slopes are usually fairly safe. + How long can you live under the snow? People die quickly from carbon dioxide poisoning because their carbon dioxide builds up in the snow around their mouths. Statistics show that about 90% of avalanche victims can be recovered alive if they are dug out within the first 5 minutes. However, after 45 minutes, only 20-30% are still alive - after two hours, almost no one is alive. + I ski on the piste most of the time, why should I be bothered about avalanche risk? Many of the accidents resulting in deaths have occurred right next to the piste, due to ignorance. They could therefore have been avoided. If you are a good skier or snowboarder who mostly skis on the piste and you play around next to the piste, then you are a prime candidate for an accident. The same goes for climbers: statistics show that the typical victim of an avalanche is a male in his mid-late 20's, has a good level of knowledge about skiing, boarding or climbing, but very little knowledge about avalanches. + Is the slope safe after an avalanche has gone? Usually it's safe. But there are a number of things to watch out for: multiple avalanche starting zones ('hang fire') looming above, dense snowfall, hard wind. If there is rapid melting going on, then there's a good chance of another avalanche coming down. It's a hard call, especially if you are going to rescue someone. + Isn't it most dangerous in springtime when there are more avalanches? Spring conditions may be the time of year when there are the most avalanches, but once a regular cycle of melting and freezing sets in, predicting the stability of the snowpack is more evident than during the cold winter months. During the freeze phase, the snowpack is at its strongest. Once free water has seeped into the snowpack, through rain or melting, then it can turn into ice when the temperatures go below freezing - the ice forms a sort of 'skeleton' that holds the snowpack together. Melting during the day and freezing at night is a classic springtime process. In these conditions, after a good freeze at night, the slopes are very stable first thing in the morning. Then, as the sun rises (warming east facing slopes first), the ice skeleton holding the snowpack together melts and the slope eventually becomes much less stable. In melting and freezing conditions, the snowpack is at its strongest during the freeze phase then at its weakest during the melt phase. In between these phases, the sking conditions can be tremendous as long as people haven't been there too late the day before. Get on the slope as the first few centimetres are beginning to melt and then get off. When melting penetrates more than 5 cm then the slope has started to become unstable and you will start to break through the crust - this alone can lead to injury. Making the right calls in these conditions takes experience - but that is part of the adventure! + Once I'm out there, how can I reduce the odds of getting caught in an avalanche? Go one at a time on slopes that are questionable, have an escape route planned in your mind, stop at islands of safety and don't bury and kill people in the group below you. Windward slopes and especially ridges are the safest routes to travel on (but be careful of cornices - you can't see where they overhang when you are on top of them on the ridge!!). Thick trees are safer, but once the trees become sparse enough to get some good turns in, you are back in potential avalanche terrain. Finally, if things look really nasty, go back the way you came... if that is not also suspect. + What causes slab avalanches to fracture? "Snow is a lot like people. It doesn't like rapid change." When people go through a lot of changes in a short amount of time, they can become very stressed and break up. Snow is the same - it needs time to adapt to change. Different types of people and different types of snowpacks have different tolerances to different types of change and stress. Dry slab avalanches occur when a relatively weak layer beneath the slab fractures, usually because too much additional weight has been added too quickly. Snow is very sensitive to the rate at which it is loaded or stressed: a metre of snow added over two weeks is not a problem. A metre of snow in two days is a big problem. A metre of snow in 3 hours is a huge problem (wind can easily deposit a metre of snow in three hours). Finally, the weight of a person can add tremendous stress to a buried weak layer, not in 3 hours, but in two tenths of a second - an instantaneous change. That is why in 90% of all avalanche accidents, the avalanche trigger is the victim (or someone in the victim's party) and 90% of the time it is a slab avalanche that is involved. Wet slab avalanches occur for other reasons: percolating water dissolves the bonds between the snow grains, which decreases the strength of the ice 'skeleton' and adds lots of stress to a buried weak layer - if there is one. + What kind of avalanche is most dangerous? Dry slab avalanches account for almost all avalanche fatalities. In the northern hemisphere, these accidents happen in winter conditions (December to mid-March) and most often on north-facing slopes. + What kind of weather produces avalanches? Wind is the most common cause of acute instability. Wind can deposit snow 10 times faster than snow falling during storms. Wind erodes snow from the upwind side of obstacles and deposits snow on the downwind (lee) sides. We call this "wind loading". The added weight from this "wind loading" also causes avalanches. If the weight of new snow is added faster than a buried weak layer can adjust to its load, then it fractures and forms an avalanche. Rapid warming can also cause dry avalanches but this is a much rarer occurrence. Rain or melting of the snow surface can also cause avalanches. For instance, rain on new snow almost instantly causes avalanches. Strong sun or warm temperatures can also cause melting of the snow and creates wet avalanches. Large wet avalanches occur because of a decrease in strength of a buried weak layer as a result of water dissolving the bonds between the snow grains. But wind, snow or rapid warming do not always produce avalanches. It depends on the condition of the pre-existing snow and the conditions during the storm. With very stable pre-existing snow, even heavy, new snow with wind can bond well and be perfectly safe in the right conditions. + What should I do if I'm caught in an avalanche? First, once the snow starts moving, try to get off the snow that is breaking up as soon as possible. You can get out of an avalanche early if you are close to the fracture line or close to the edge (or flank) especially if the snow isn't too broken up. If you are close to one of these edges, do everything you can to move towards it. If the fracture line is just above you, try to allow the snow to move past you. For example, if you are on skis, side-step up, grab a tree, do whatever you possibly can. If the fracture line is way above you and you can't make it to the side fast, point your skis or snowboard downhill, say a prayer if you are so inclined, go like hell and try to get out of the way lower down. There is a lot of controversy about what you should do if you are caught in the turning snow. First, see: 'What is it like to be caught in an avalanche?' above. Some say swim (since a person is about three times denser than moving avalanche debris) and others say roll. The most important thing is to keep your mouth free of snow especially when the snow comes to a stop; an air-pocket is essential to your survival in what amounts to a concrete tomb. It's almost impossible to dig yourself out of an avalanche. Most people suffocate within 15 minutes if they haven't actually been killed by the avalanche (approximately 10%). Before it stops, you can try pushing a hand upwards. Visual clues are the fastest way for rescuers to find you, but then, you may not be able to make an air-pocket. For climbers... this whole scenario is horrific, especially when ice axes and people are attached to each other. + Pistes : What do the different colours of piste refer to on the maps? Black: technically difficult and steep. Advanced levels only. The scale applies whichever activity you are doing (skiing, cross-country or biking). + How should I pack my skis and/or snowboard? If you like your skis and are travelling by air, it is imperative that you pack them in a ski or board bag for protection. Most airlines will still take your skis if they are not in a ski bag; just don’t be surprised at the condition they arrive in at the other end of your flight. A ski or snowboard bag can also be packed with soft items (ski trousers, jumpers etc) around your skis or board to give them added protection. Just be careful if the equipment is covered in storage wax. If driving to resort, the most convenient alternative is a roof "coffin" style box that will carry several pairs of skis/boards, boots and poles. A roof rack is also a handy alternative and can be retned from many ski shops. If using a roof rack, try to cover the bindings over to prevent them getting covered in grit and salt. Roof boxes and roof racks should be lockable and therefore fairly secure from thiefs. + Can I get sunburnt in winter? Very easily! Always take precautions against the strength of the sun on a skiing holiday. At altitude, and with the reflection off the snow, the sun’s rays can cause damage very quickly. Always, always wear sunglasses, even when the sun is not shining. Apply sunscreen, apply it thickly and keep applying it (you can still burn though cloud cover). Putting on factor 40 once in the morning will not protect you from burning. Reapply every couple of hours. + What are the commonest injuries? Skiers: knee ligaments (anterior cruciate ligament in particular) Make sure your ski-bindings are adjusted correctly for your weight and level of skiing. Over 80 % of accidents to skiers which result in sprained knee ligaments resulted from skis not coming off during a fall. Snowboarders: injuries to wrists and head (wear a helmet and wrist protectors) and broken collarbones. Be careful not to crash into anyone when you are wearing a helmet as this can injure them severely(seriously!). + How can I reduce the risks of injury? Injury rates for skiing are much lower than most people imagine, at between 0.2 and 0.4%. The French Society of Orthopaedic Surgeons suggests the following eight points to reduce your risk: improve your physical fitness before your holiday; ensure bindings are correctly set for your ability, weight and height; chose the correct equipment for your level; wear a helmet (especially in a snowpark); warm up before setting out; make sure you take enough food and liquids; and take a rest or cut short your day when you start to feel tired. To this we would add: follow the piste safety code (see ‘Activities and Ski FAQ); hire equipment from a specialist shop rather than borrowing from friends; stay within your own limits and don’t try to keep up with more experienced friends. And bring non-slip boots for walking around the resort as pavements can be icy. + Saturday or Sunday travel? If you are coming out at the weekend which day should you travel? Traditionally Saturday-Saturday travel to France has been the main option. However, Sunday-Sunday is becoming ever more viable an alternative to the near total saturation of Saturdays. Typically Sunday travel has been the preserve of smaller, more exclusive operators but now more companies have added these products into their brochures via their committed bedstocks. Choice of day will of course be determined firstly by your commitments back home and then availability. However, thinking that with Sundays you won't have a 'day at home to recover' should not be a reason not to seek out this alternative. These factors should definitely feature in your considerations.